In spite of its self-evidently gloomy name, ‘doom’ is a vibrant genre. Contrary to the expectations of some, the scene is not exemplified by bearded man with long, scraggly hair wearing sandwich boards and proclaiming that ‘the end is nigh!’ (although the beards and hair feature fairly often). No, doom can run the gamut from psychedelic, Black Sabbath-tinged heavy metal to crushing, slow riffs and unholy bellows. Admittedly, I tend towards the latter in my listening. 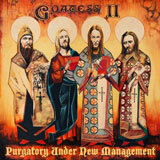 If you want some of the former done well though, then Purgatory Under New Management by Goatess is for you. Their brand of doom is full of stoner grooves, with strong nods towards classic heavy metal and the genre’s big names. This should be no surprise given the band’s pedigree – vocalist Christian ‘Christus’ Linderson, for example, has sung for Lord Vicar, Count Raven and Saint Vitus. He’s a veteran of the scene, and brings his experience and weight to this mammoth release. I say ‘mammoth release’ partly because the music is punchy and full of nice meaty stoner grooves to get your teeth into, but also because of its sheer length: 65 minutes. This might not seem like a particularly long time, but in our age of short attention spans and instant gratification it’s a sight longer than the 45 minute albums I’ve grown used to. Of course, it also means that Goatess go slightly psychedelic and progressive, mixing up their heavy riffage with nice doses of noodling and spacey jams. Most songs benefit from the longer track times. The title track opens with a little theological sermon (given the tendency to use recordings of news reports on serial killers or occult orgies in doom releases, this is a nice tongue-in-cheek feature) before launching into a slow and steady piece of doom. After three minutes a psychedelic staccato guitar line is laid over the top, introducing a nervous energy into the track. Each section builds on the previous section, such that Purgatory Under New Management feels far shorter than its 7:41 runtime. Goatess sometimes experiment wonderfully with genre, moving away from doom into strange new realms. Crocodilians And Other Creepy Crawling Shhh…, for example, is a 6:30 National Geographic special about marshy reptilian ecosystems. The closest musical comparison I could think of was the sublime electronica duo Lemon Jelly, who also liked to couple naturalist narration with bubbling aquatic sounds to trancelike effect on their 2000 debut. Gradually fading from swampy field recordings into a great spacey jam, Goatess are clearly having fun with this one. I’m not sure how this fits into the album’s exploration of Catholic doctrines on purgatory, but I don’t mind at all. The extended track times don’t always pay off, it has to be said. The concepts of purgatory and Catholic doctrine that Purgatory Under New Management deals with are lofty, and require a bit of space for expansion, but tracks like Murphy Was An Optimist don’t match that level. A very strong start, with some great keening vocals from Linderson, becomes a little too repetitive after a while. The album’s second half features some stellar tracks though. Silent War has a hard-hitting riff, simple but with perfect musicianship. You can’t help but nod your head in mute appreciation at it, topped off with Linderson’s powerful cries. Wrath Of God’s seductively clean guitars serpentine over frenetic drumming before dropping into a beautifully fuzzed-out buzzsaw chorus. Its equal parts Blue Oyster Cult and Melvins. Goatess are no strangers to doom metal, and they prove it in Purgatory Under New Management. The musicianship is excellent, the songs well-crafted and compelling enough (most of the time) to comfortably fill out their long runtimes. The album’s subject may be quite theological, but there’s nothing academic in enjoying the pounding riffs and trippy jams. Best of all, Goatess has inspired me to revisit those classic doom bands that I’ve neglected for too long.